A couple of years ago, following the publication of an edition of the source text, I wrote a piece discussing an earlier rector, known only as Thomas, named in the forest regard roll for Windsor Forest of circa 1258. Now, having recently acquired another medieval text edition which identifies one-and-a-half “new” rectors (and having sat on a further such nugget for around a decade), I thought it would be of value and with any luck interest to others if I produced an updated list of rectors of medieval Puttenham. It also affords the opportunity to discuss the first direct evidence for the Black Death having an impact on the parish. Ralph (le Forester?). I came across the first of my “new” rectors in a source the like of which I had not encountered before (but is probably familiar to late medievalists). This is a ‘writ de etate probanda‘, dated 18th February (my birthday!) 1352 (not my birth year! ), by which the age of Katharine de Wyke was determined (Atkinson, Morris & Stamp 1916, 450-52). 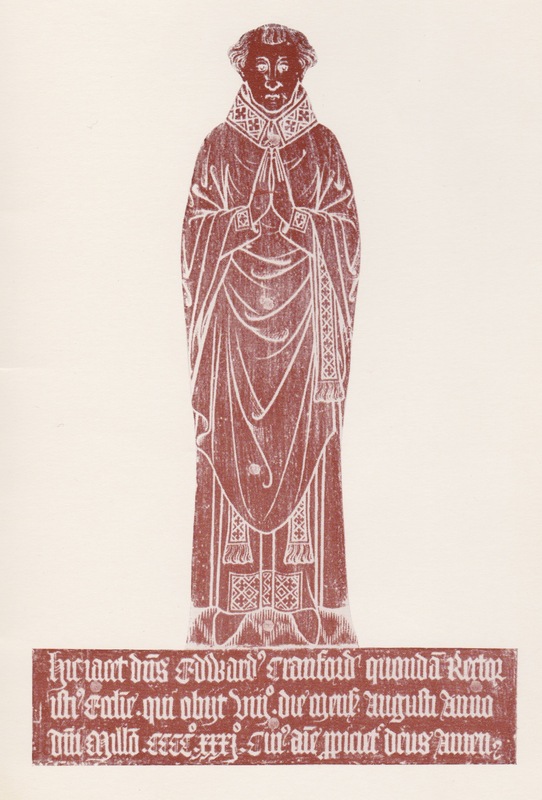 Katharine was the daughter of Peter de Wyke and heir of Joan de Wyke; you won’t be surprised to learn the family were connected with the manor of Wyke, historically an outlier of Worplesdon parish (as stated in the writ) but now part of Normandy parish. In the writ, various local men came forward to testify that they agreed Katharine was 16 years old on the feast of St Edmund the previous year, i.e. 20th November 1351. The seventh to confirm her age was John le Forester, 40 years of age, who recalled that on St Edmund’s day in the eighth year of the reign of Edward III – Saturday, 20th November 1335 – not only was Katharine baptised at Ash church (perhaps for reasons of convenience, being closer to Wyke than Worplesdon), but also his brother Ralph was ‘presented to the church of Potenham by prior of the Hospital of St Mary without Bisshopesgate’, holders of the right of advowson for Puttenham since 1307. To hammer home his point, John noted Ralph had given Katharine a silk girdle (Latin zonam) ‘which still remains in her possession’ (Atkinson, Morris & Stamp 1916, 451). Ralph can therefore be inserted between Henry Sigher (instituted 20th June 1322, and presumably the Henry le Sygher “of Guildford” who granted ownership of Cut Mill and nearby lands in Puttenham parish by a feoffment with a dating clause equivalent to 1st July 1332) and John (rector in 1348, about whom more in a minute). It is impossible to say if he succeeded Henry and was in turn succeeded by John given our very limited range of relevant documentary sources. We might, however, refer to him as Ralph le Forester, given the capitalisation of his brother’s second name, though it should be added there is no other record of a Forester family in Puttenham parish in the medieval period. John de Neuport. Less than a year after the previous record, an entry in Bishop Edington’s register dated 10th March 1349 (and made at Esher) documents the admission of ‘M. John de Neuport acolyte to the church of Puttenham, vacant by the death of John Puppe, last rector’. (Acolyte in this context refers to one who ‘assists the celebrant in the performance of liturgical rites‘.) Again, it specifies the advowson was in the hands of ‘the prior and convent of St Mary without Bishopsgate, London’ (Hockey 1986, 66 no. 383). This is a typically brief acknowledgement that, almost certainly, Puppe had died because of the Black Death. The best estimate is the plague arrived in southern England in May or June 1348, spreading rapidly and with deadly effect in the following months. As Hockey notes in the introduction to the edited Register (1986, xii), the Black Death ‘struck the diocese of Winchester with special violence’, leading to the death of a little short of half of all its beneficed clergy. It’s impossible to say where Puppe’s sabbatical with the Imworths took him, but it’s very likely he was not resident in Puttenham at the time of his death; the seat of the Imworths was the eponymous manor (now Imber Court) in Thames Ditton parish in the north of Surrey. All the same, this is the first piece of evidence I know of that associates the parish of Puttenham with the effects of the Black Death. Elsewhere on Surrey Medieval, I’ve suggested that the stability in Puttenham’s population figures which can be derived from comparing the 1332 Lay Subsidy returns with those for the 1381 Poll Tax is not matched by stability in the recorded family names. I took – and take – this to indicate there were sufficient incomers attracted to settle or at least hold property in Puttenham parish to replace those killed by the Black Death. The direct testimony for Puppe’s death and succession by a man who had perhaps served as his acolyte but whose locative surname indicates roots outside Surrey (precisely where is impossible to say) is in effect a microcosm of the same trend. The volume I bought is only the first part of the edited Register of Bishop Edington, but this at least allows me to suggest John de Neuport did not succumb to the Black Death since there are no further entries directly relevant to Puttenham up to September 1363. 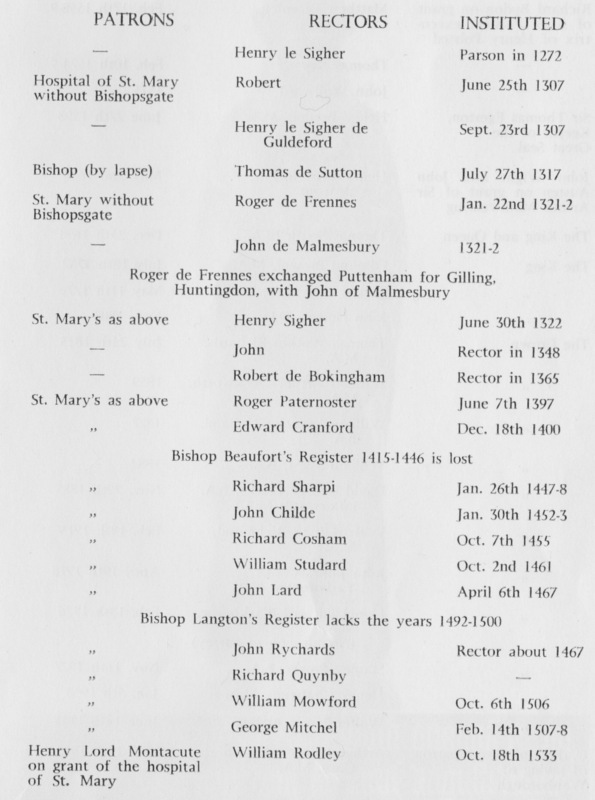 He must have died (or exchanged the living) not long after, as the existing Gosling/Dugmore rector list notes Robert de Bokingham was rector of Puttenham in 1365. Unfortunately, it appears the parish priest wasn’t liable for either of the two previously-mentioned 14th-century fiscal levies, so there’s no telling whether Robert was still in post 15 or so years later at the time of the Poll Tax. Talking of lists, it seems only right that I end with my new improved one of the medieval rectors of Puttenham, with my discoveries highlighted in bold, just because. I’ve also added in the name of Walter de Shalford, who in 1307 was given custody of both the ‘old and infirm’ rector of Puttenham, Robert (himself newly appointed, evidently a most unsuitable choice! ), and the rectory, accounting directly to the Bishop of Winchester ‘for the profits and duty’ (Dugmore 1972, 33). If he ever held the status of rector of Puttenham then he did so fleetingly, as Henry le Sigher de Guldeford was instituted on 23rd September of the same year. The new list shows that there remain obvious gaps in our knowledge, such as who succeeded the memorialised Edward Cranford following his death in 1431 (or conceivably his resignation at an earlier date). My experience up to now tells me it’s impossible to predict when new information will be found, but that future discoveries are as inevitable as me one day writing a follow-up to this piece! IMPORTANT! My prediction in the final sentence came true, as further research undertaken in preparation for a talk to the Puttenham and Wanborough History Society in October 2016 highlighted a number of errors with the above list. An improved, corrected version can now be found at the foot of my ‘Puttenham Church Week’ page.